So, you're interested in knowing how to sell gold for cash? That's no surprise. Times are tough and everyone's looking to find extra money anywhere they can. If you have old jewelry lying around that you won't wear again, or coins or bullion in your basement, now may be an excellent time to sell gold for cash. Gold prices have been at near record highs for months, and show no signs of dropping any time soon. If you're looking to sell gold for cash online, there are a few things you should probably know. It's something that millions of people have done successfully, but obviously when you're talking about mailing off valuable pieces of property, you want to make sure it's done safely. Here is a quick description of how the process works with a reputable online dealer. o 1 – You contact the dealer and tell them that you're interested in selling gold for cash. Most gold-buying websites have electronic forms that allow you to do this. o 2 – The dealer then sends you a padded envelope, and often pays for insurance on it as well. This is a good point to look for when shopping around to sell gold for cash. o 3 – You put your items in the envelope and send it back to the dealer. o 4 – After a reasonable amount of time, usually around 24-48 hours, the dealer contacts you back with an offer for the gold. o 5 – At that point, you can choose to either accept the offer, or else decline it and have your gold sent back within a couple weeks. o 6 – If you decide to sell gold for cash, the dealer then sends you your money, usually only a few days later. 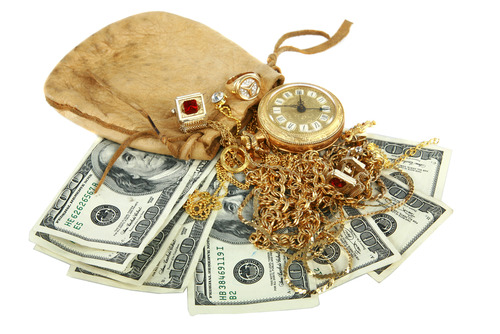 The most important thing to remember when trying to sell gold for cash is that you should shop around. It's a good idea to take it around to local pawnshops first to get an idea of its value, before mailing it off. Once you get your offer, the dealer may try to pressure you with “limited time” offers, but it's important to get the best deal possible on your gold. You don't have to take the first offer you get. Trying to sell gold for cash can be an excellent way to get yourself through tough economic times. Be smart, shop around, and get the best deal you can . What are the Latest, Trendiest Gold Jewelry Accessories?